What is it like to go orienteering with Napalm Death? Comedian Stewart Lee has revealed that he used to go orienteering with the original line-up of Napalm Death. 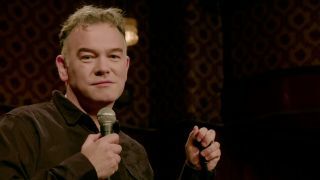 In the first episode of his latest Comedy Vehicle series, Stewart Lee remembers his time at school with Napalm Death and how they went orienteering “every other weekend in Shropshire”. But of course this isn’t any old orienteering… as you find out through perhaps the best grindcore/map reading joke ever conceived. The show closed with a sneak peek at what the BBC Four show Orienteering With Napalm Death would look like. Don’t pretend you wouldn’t want to watch that.